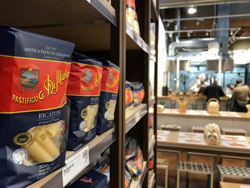 If you are visiting FICO EATALY WORLD in Bologna, the largest agri-food park in the world, do not forget to stop at Di Martino’s booth, the famous pasta-making factory headquartered in Gragnano, which has been keeping on the values of three generations with professionalism and passion. At the beginning of G. Di Martino pasta factory, in fact, there is the story of a family strongly rooted in its area and traditions, inspired by passion and commitment that led to brilliant ideas and technological innovations, still respecting human beings and environment. 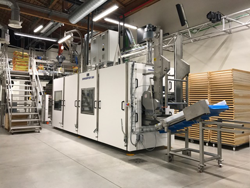 Short, long and special formats: the pasta factory chose Storci since they needed a Company which could guarantee production versatility and in the meantime the quality, an aspect that could not be left out of consideration, even in this special and peculiar background that is F.I.CO. Owning already three Storci’s lines - special pasta, orecchiette and the last one for short pasta, under the trade mark “Pastificio dei Campi”- they decided to purchase an Omnia line 250/200 for short, long and special pasta that, thanks to its features – compactness and multi-purposeness – turn out to be perfect to fit into the production area in the agri-food park. Omnia is the line able to produce a wide range of formats for all pasta-makers: those who are just approaching the pasta market and would like to act decisively with many formats and those who are already riding high and would like to specialize in some shapes such as paccheri, candele, ziti, conchiglioni, etc. The line has been ad hoc adapted to the park space for the production of the various formats to be shown to visitors. If you would like to visit Di Martino’s booth and our line, go to area No. 047 at F.I.CO. Park.